Each year near the beginning of August, you can take a step back in time at the Port Oneida Fair and experience life as it was in the late 1800's and early 1900's. Imagine the life of the pioneers as you help bale hay or watch a broom-maker at work. Learn about spinning, basket weaving, soap making, butter making, candle dipping, and fur trapping. Listen as park rangers and local history experts share the area's history. Watch as teams of oxen and horses cut, load, and haul hay and artists and craftsmen demonstrate their skills. The fair is held at six of the historic farmsteads in Port Oneida. 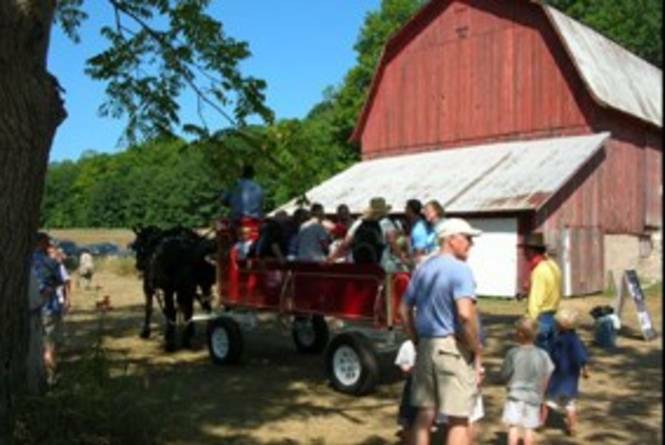 Each farm has a variety of artists, crafts, food, and activities for visitors. Click on the farm names to see what's happening at each farm. A shuttle bus runs between the farms on a regular schedule during the fair, so you can park your car and easily get around to the different venues.